I’m a huge fan of the Greek islands for short-haul bliss, and my top choice is Rhodes, which really can keep both an action man and an avid reader happy! Rhodes is the fourth largest Greek island, and is just 20km from the Turkish coast, with lots of sunshine hours year-round – hurrah! It’s a little different from most of our trips (and one of the few places we’ve visited more than once), but I think it’s worth writing about as people can be dismissive of ‘beach breaks’, and I want to show that you CAN find new experiences during a week by the beach! So if you like to mix up your relaxation with activities, here are my Top 5 Rhodes (and beyond) Must-Dos. 1. Visit the pretty island of Symi. We took a whole-day trip from Rhodes town to this small Dodecanese Island with tour operator Tourtlee. It’s worth the long morning at sea to reach this picturesque spot that simply oozes Greek charm. There’s some gorgeous food to be found both on and off the beaten track, and this tour arrives in time to find lunch – just watch out for the mopeds in the otherwise quiet harbour! In case it wasn’t perfect enough, on our way back we stopped for a swim in the clear blue waters of St George’s bay, and watched the wild goats frolicking on the beach. 2. 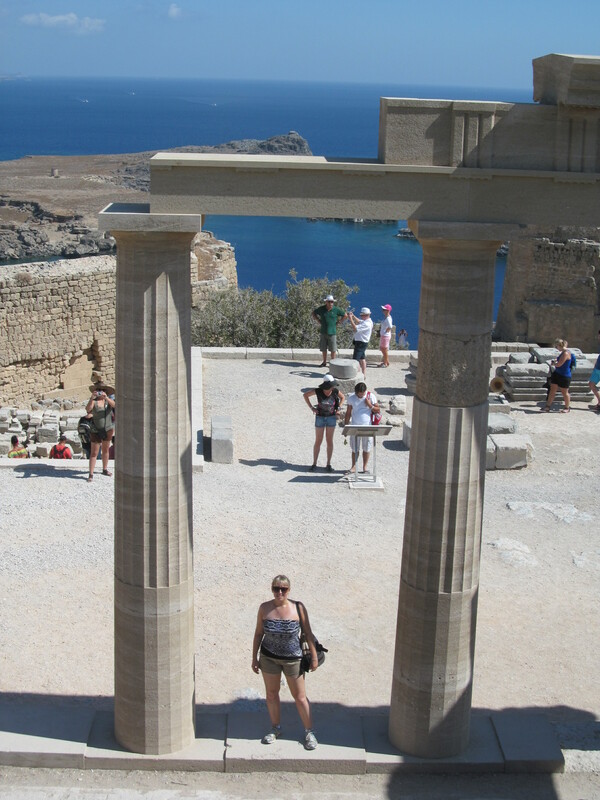 Let the Acropolis of Lindos take your breath away. 50km south of Rhodes town, wander the narrow and twisting uphill streets of Lindos, ducking into one of the many tavernas for hummus or to cool off, and browse the shops selling local crafts. When you reach the stunning Acropolis, enjoy it for its archaeological significance AND the incredible views. 3. Join the wild goats for the hike up to Tsambika Monastery. Make an early start to avoid the summer heat, as this is all UP! Approx 350 steps, just outside Kolymbia, will take up to this small, tranquil Byzantine church, with views of the coast and mainland from its shady courtyard. Bring a bottle of water, as this is no tourist trap and there is no shop at the top! This church may be small, but it is mighty, with local folklore surrounding fertility attached to it – Ask the locals why so many children on the island are named Tsambika and Tsambiko. 4. 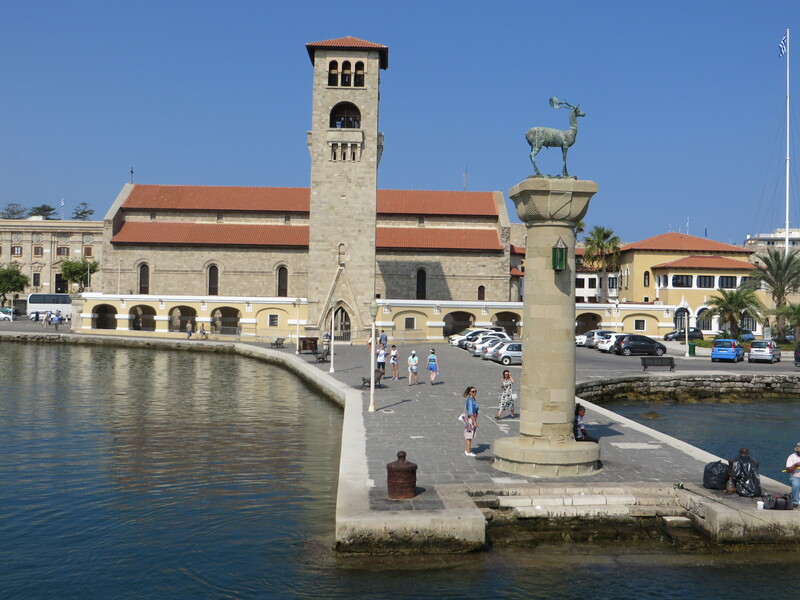 Lose yourself in Rhodes Old Town. This medieval town is said to be the oldest inhabited medieval town in Europe, and its the perfect place to wander. It’s a UNESCO World Heritage site with a rich history, so look beyond the tourists and enjoy walking the city walls, sup something cold overlooking Madraki Harbour, or check out the ‘Rhodes by night’ “Lanterns” tour for a different perspective. 5. Get onto the water. I love the multi-sensory experience offered by the sea, and feel more serene just being close to the water. There’s no shortage of activities on the beaches of Rhodes, so whether you prefer to paddle by the shore, relax on a glass bottom boat, or seek thrills jet-skiing or parasailing, there is sure to be something that catches your eye, so why not try something new! Maybe I haven’t persuaded you that a ‘beach break’ can be so much more, but whatever you’re into, and wherever you’re heading, I hope you can compromise on something awesome this year!